This tapestry "Vue Antique" is inspired from the 19th century fascination with exotic lands. This wonderful tapestry has elements such as ancient ruins, old castles and the famous red drapes as well as exotic flowers which cover the landscape. This is an unusual work of art which stirs the senses and the imagination. The explorers gaze at the marvel of the scene as they explore the land. 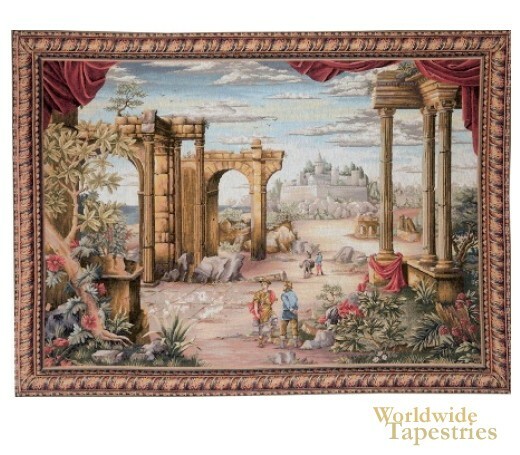 This large art tapestry "Fresh Vue Antique" is backed with lining and a tunnel for easy hanging. Dimensions: W 80" x H 60"